The lighting scheme is an important facet for any Bentonville home. Illuminating your home can be both decorative and functional. One of the most versatile lighting systems is recessed lighting. With the many styles, colors and sizes available, recessed-lighting presents many benefits to homeowners and builders. One money saving benefit is that it uses the most energy efficient lighting parts and operates on a lower voltage than other lighting choices. It uses a dimmer switch to reduce electricity usage. Recessed-lighting can be installed anywhere and is a highly customizable lighting choice. 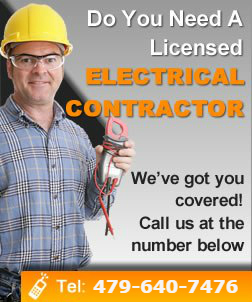 Call the master electrician at Davitt Electric today to get a quote and all of your lighting questions answered. No matter what indoor lighting choise you decide to go with, our electricians can install any type of indoor lighting. Our Bentonville electricians are experts with lighting and installation. Our electricians will always treat your home just as if it were their own home or better. We have a reputation for excellent customer service. When you chose Davitt Electric you know the job will always be done right the first time. The job is not finished until you are 100% satisfied with our work.